French Toast Casserole made with thick sliced Texas Toast is one of the easiest recipes you’ll ever make for breakfast or brunch. 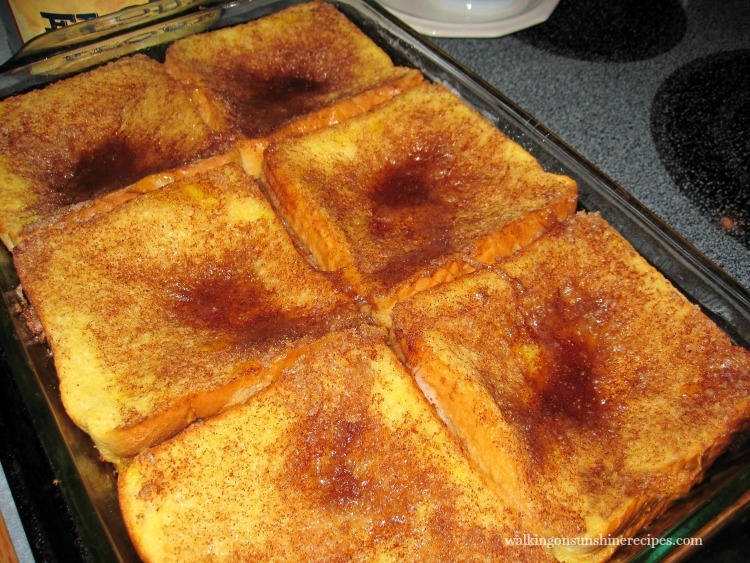 This recipe for French Toast Casserole was the #1 recipe on the blog for years. Even with the bad photos. Then I moved the platform my blog was hosted on and for some strange reason this recipe got lost. Really, it was lost in the “cloud” and it couldn’t be seen for the longest time. Thankfully my host went and found the recipe but it still needed to be fixed and now, unfortunately, it’s no longer very popular…especially with Google. But that’s going to change because I’m updating the post and I know you’re all going to love it so much more than when it was originally published back in 2013. The secret to making this French Toast Casserole recipe is using Texas Toast. Do not even attempt to make this recipe with regular sliced bread. Texas Toast is thick sliced white bread that you can find in the bread aisle of your local grocery store. Do not confuse it with the frozen garlic Texas Toast either! That would be a total disaster! 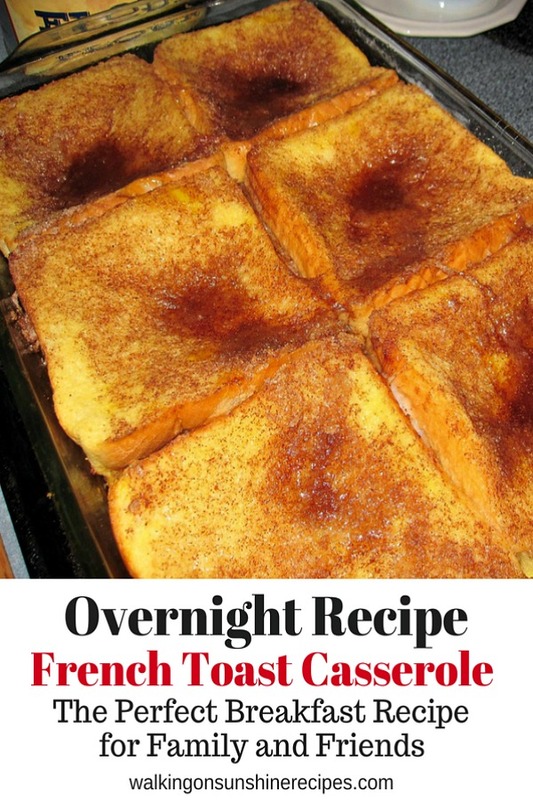 This is also an Overnight French Toast Casserole recipe so you put it together the night before you want to serve it and then let it sit in the refrigerator overnight. The next morning you bake it in the oven just before your guests arrive or you want to serve breakfast. 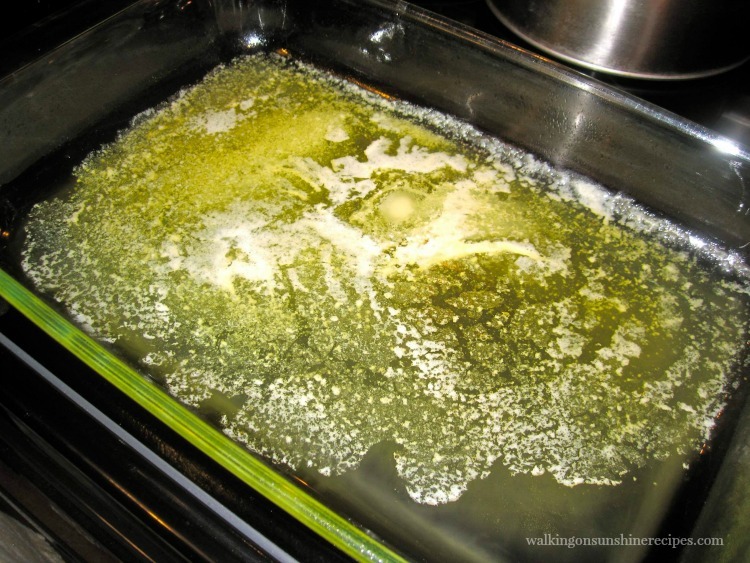 Melt the butter in the microwave and then pour it into the bottom of a 9X13 casserole dish. Then mix together the brown sugar, cinnamon and nutmeg then set aside. Whisk the eggs, milk and vanilla together in another bowl. Let’s start putting the casserole together! Lay six slices of Texas Toast on top of the melted butter. Then sprinkle with half of the brown sugar mixture, followed by a final layer of Texas Toast. 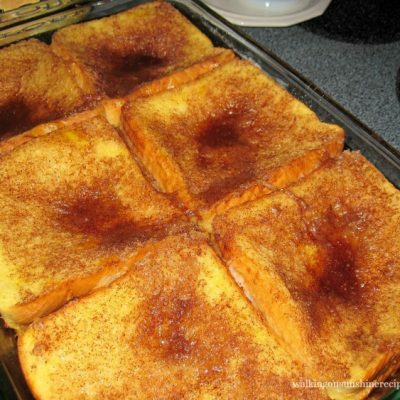 Then pour the egg mixture on top of the slices of Texas Toast followed by the remainder of the brown sugar mixture. Cover with aluminum foil and place in the refrigerator overnight. The next morning, remove the casserole from the refrigerator and cover it with a new piece of aluminum foil. Bake the casserole in a preheated 350 degree oven for 30 minutes. Then uncover the casserole and bake for an additional 15 minutes until it is set and slightly browned. Let sit for a few minutes before serving with warm syrup. This is an amazing recipe, however, it’s very rich! So I only serve it for special occasions like holidays. Casserole Dish – 9X13 size which is what you need for this recipe. Cinnamon Rolls made with Frozen Bread Dough – if using a yeast dough scares you, try this recipe! Spinach Bacon Frittata – one of my family’s favorites for brunch on Sunday! French Toast Casserole made with thick sliced Texas Toast is one of the easiest recipes you’ll ever make for breakfast or brunch. This is an overnight recipe so plan accordingly! In a bowl, mix together the brown sugar, cinnamon, nutmeg and chopped pecans and set aside. Place the butter in a microwave safe bowl and place in the microwave. Melt the butter in 20 second intervals and then pour it into a 9x 13 casserole dish. Set aside. In another bowl, whisk eggs, milk and vanilla together. 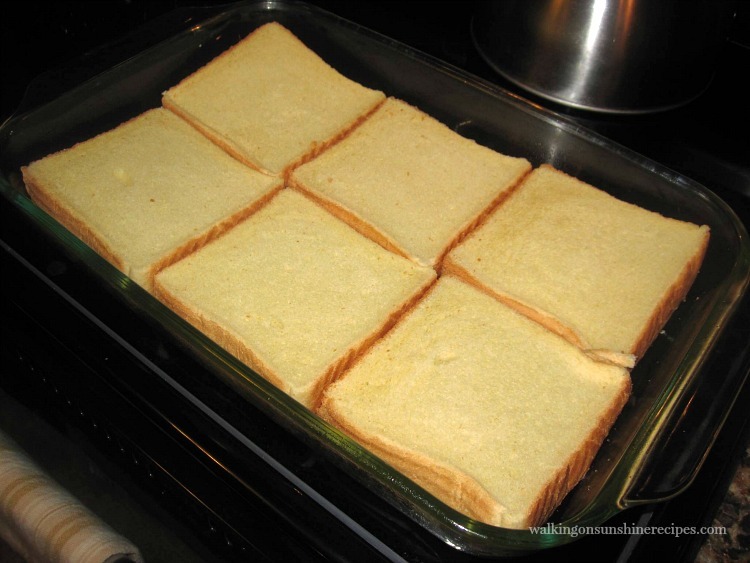 Lay a single layer of the Texas Toast in the casserole dish on top of the melted butter. My 9X13 casserole dish can fit 6 slices of Texas Toast on the bottom. Sprinkle half of the brown sugar mix over the bread. Layer the second half of the Texas Toast on top of the first layer. 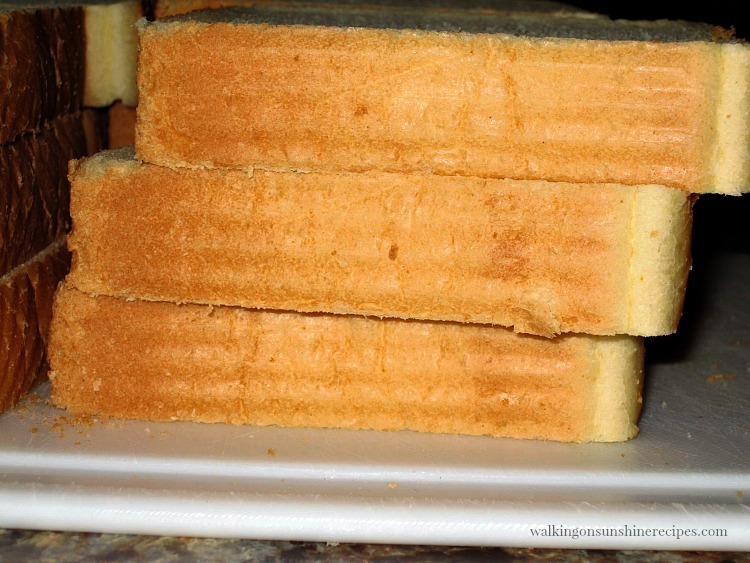 Pour the egg mixture over the bread slices, making sure all are covered evenly. Sprinkle the remaining brown sugar mixture on top. Remove the casserole dish from the refrigerator and cover with a new piece of foil. Let it stand at room temperature for about 20 minutes. Bake the casserole for 30 minutes in a preheated 350 degree oven. Then uncover and bake for an additional 15 minutes. The French Toast Casserole should be browned and set. Cut and serve with warm syrup. 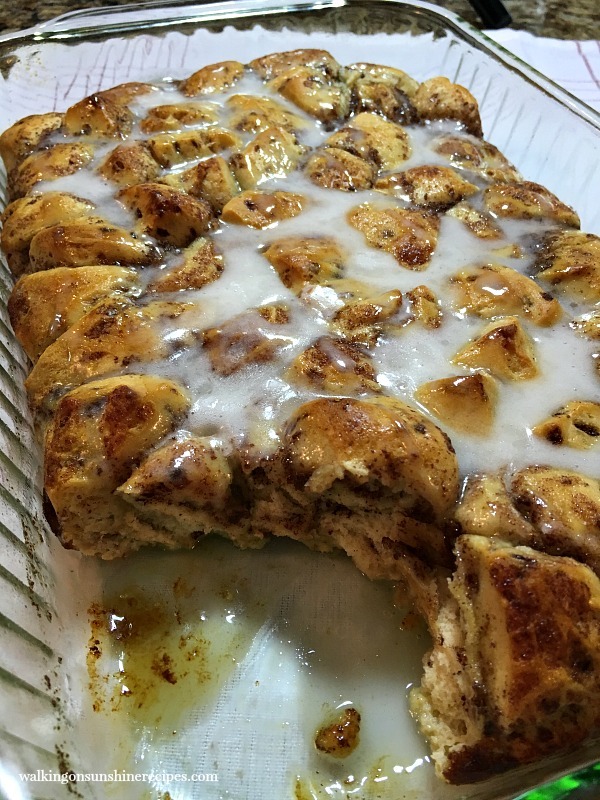 Here’s another incredibly EASY and delicious recipe: Cinnamon Roll Breakfast Casserole. This is one delicious breakfast!! Mmm…the Mr. is a huge French toast fan and would LOVE this! Can i get Texas toast in the UK please. I don’t know about that! If you can’t find Texas Toast where you live, buy a loaf of good quality brioche bread and cut it into chunks. Place the chunks of bread in the casserole dish followed by the sugar mixture and then pour the egg mixture on top. Cover and refrigerate overnight. Let me know how that works for you! Thanks for visiting! Can this be put together then frozen before baking? I have never tried to freeze this recipe before baking. If you do, let me know how it comes out! Thank you for visiting! Quick question: Do you serve 6 people with this recipe, or do you cut it into smaller servings? This would serve 6 people. You could cut into smaller servings as well. I like to usually make scrambled eggs to go along with this recipe since it’s usually for a holiday breakfast or brunch. Thank you for visiting! I am confused. How many pieces of Texas Toast are used, 6 or 12? It sounds like you make two layers of the bread but that sounds like a lot of bread for 6 people. You use 12 slices of bread. The casserole is a double layer casserole, so you place 6 slices on the bottom, add the brown sugar mixture, then top that with the remaining 6 slices of bread. You can definitely serve this to more than 6 people, but it is for holidays and special occasions and at times my family of five will eat the entire casserole. Thank you for visiting! 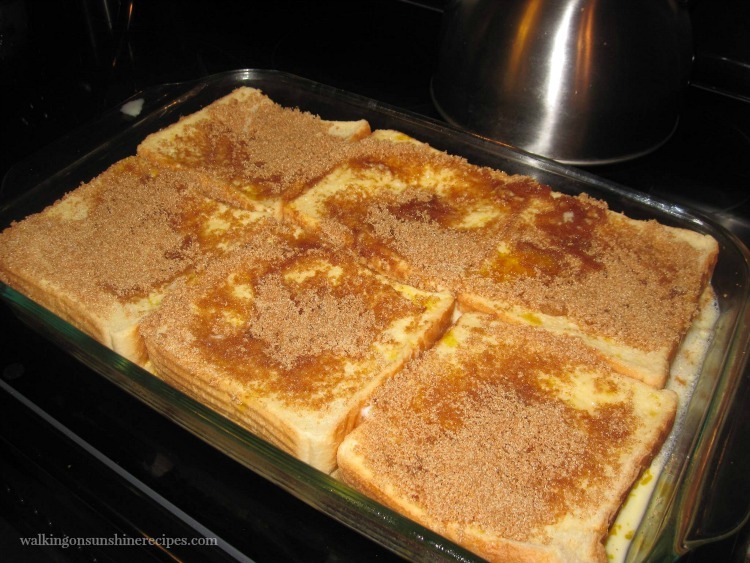 I LOVE overnight French toast casserole and make it every Christmas morning and Easter. It’s a tradition for us for sure! But, what’s the point of taking casserole out of fridge to rest at room temp before putting in oven? Never seen that done before and haven’t done so. I’m making your overnight casserole tonight for Christmas morning tomorrow! Merry Christmas!!! I like to put the casserole in at room temperature, but you can put the casserole directly from the refrigerator into the oven. Thank you for visiting. I hope you enjoy the recipe! Do you mean the Texas Toast that has garlic & butter already on it in the freezer section?? No! You need to use thick sliced white Texas Toast Bread that you can find in the bread section of your grocery store. It’s actually called “Texas Toast Bread.” Hope that helps! Thank you for visiting!